The Burlingame Space is a creative space for making music: small concerts, recitals, rehearsals, classes, lessons, recording sessions and more! The space is available for rental when not in use by regular classes. If you have a serious inquiry about use of "The Space", please contact us! Music needs to end by 10pm. Rates are reasonable. REHEARSALS/RECITALS: It is a perfect place for rehearsing a Jazz Big Band or giving a college recital (for example). 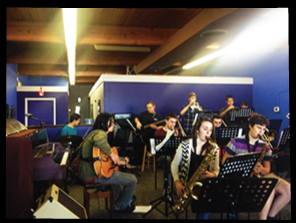 We want the Portland music community to have an option available for rehearsing larger ensembles. MUSICIANS FROM OUT OF TOWN: We LOVE to host clinics with musicians from out of town (and a series of private lessons with that musician). We have also hosted rehearsals for touring bands. PRIVATE LESSONS: If you are looking for a place to teach private lessons, you can rent the space. However, we aren't set up to get you students, you will have to do your own advertising, business planning etc. CLASSES/WORKSHOPS: If you are interested in running a class, the space is available! Just like private lessons, we are unable to send you students or assist with the business or advertising side of things. We are looking for entrepreneurial minded people!